In Years 7, 8 and 9, the English Department introduces the idea of becoming a “subject specialist” to pupils, so that they clearly understand that the ability to use English precisely, imaginatively and in a sophisticated manner is a valuable life skill which will help them to achieve success in all walks of life in their future. Our Key Stage 3 provision fully meets the new curriculum of 2015; across the three years, pupils are offered a varied diet of written, spoken and visual texts, ranging from poems, novels and plays, by authors such as Blake, Dickens and Shakespeare, in the literary canon, alongside modern texts like Michael Morpurgo’s “Private Peaceful” and John Boyne’s “Boy in the Striped Pyjamas”. Teachers study a variety of texts with our pupils so that they can both appreciate their style and structure, and improve their own writing skills as a result. 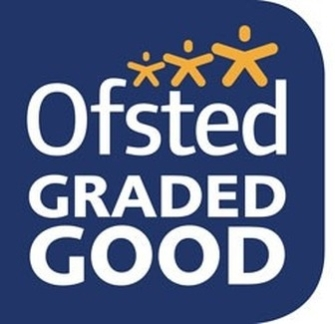 Children are encouraged to work both independently and in groups in a well-resourced and enthusiastic environment, where achievement is recognised and rewarded; over the three years, there is a balanced approach to assessment, with each strand of the Curriculum for English being addressed equally. Assessment objectives are designed to help students make progress by clearly signalling the level they are currently working at, as well as what is required to move forward. 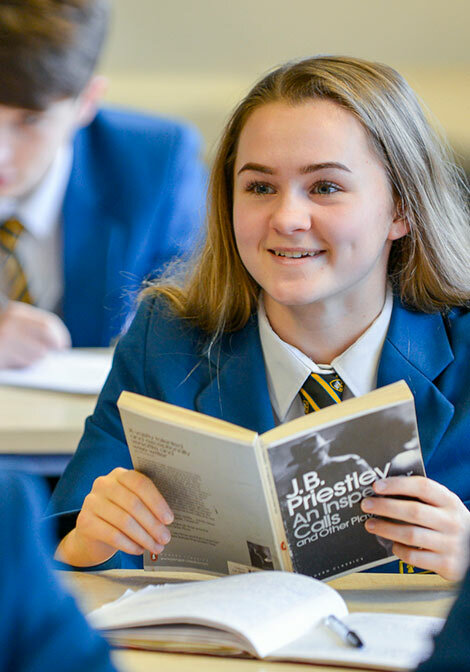 At GCSE, all students follow the AQA English Language and English Literature courses, gaining two qualifications at the end of Year 11. This is a linear course and has been newly introduced by the government for study in September 2015. Students are not assessed internally, as has formerly been the case; rather, they sit examinations at the end of Year 11 which test their knowledge and skills from the entire two years’ study. Reading. Students are tested on their ability to read and understand texts, including both fiction and non-fiction, from pre and post 19th century sources. Writing. Students are expected to be able to write for different audiences and purposes, including both a transactional and creative piece of writing. Spoken Language. Students show their ability to present information and ideas in a formal setting, responding to questions and feedback and using Standard English appropriately. There are two examinations for English Language, testing reading and writing skills; they each carry 50% of the total marks and both last for 1 hour and 45 minutes. The Spoken Language element of the course does not count towards the final grade but is awarded separately. This is internally assessed. There are two examinations for English literature: the Shakespeare play and 19th century novel are examined together over 1 hour and 45 minutes, carrying 40% of the total marks. Students are separately examined on the modern drama text, poetry collection and unseen poetry texts; this paper last for 2 hour and 15 minutes and carries the remaining 60% of the final marks. In the 6th form, students have the option of studying English Language (AQA), English Literature (AQA A), and Media Studies (WJEC). Assessment for all subjects is via a combination of terminal examination and non-examination assessment. In Language, students look at a variety of texts, both spoken and written, from the literary canon and from various media. They learn to develop their analytical skills, learning to comment on the way language has been used to have certain effects. In Literature, students study various literary texts – novels, plays and poetry – both old and new, ranging from Shakespeare to the present day. Once again, they learn to refine their analytical responses, and their ability to structure an argument, as well as honing their ability to use the specialist language of the subject. In Media, students study moving image texts in depth alongside a study of media institutions and audiences. Theoretical arguments are applied at various stages as students develop confidence in their analysis, whilst coursework units develop students’ practical skills with both print and moving image texts. For all A Level subjects, various trips and visits are arranged, in order to enrich students’ understanding of their chosen specialisms, and to help them broaden their experience of life. In the Sixth Form, students are encouraged to work much more independently than in the years leading up to this point, in order to prepare them for university or college. 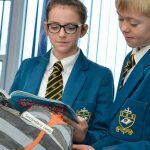 They will be involved in research; they will work in groups, often being given the responsibility of leading lessons and helping others to learn. The more wide reading around their subject they do, and the higher their levels of personal organisation, the greater their level of success. Curriculum groups at this level are much smaller, thereby giving the students the sense of much greater freedom and autonomy, preparing them for life after St Nicholas. In order to study English Language, English Literature or Media Studies A Level, students need to have a grade 5 or above at GCSE.